GsmTerminal-232 is a quad band GSM modem/GPRS Modem for the transfer of data, SMS and faxes in GSM and GPRS networks. Built-in EIA-RS232 com port, 300 to 115200 baud. Control by ITU, GSM, GPRS and Custom AT commands. 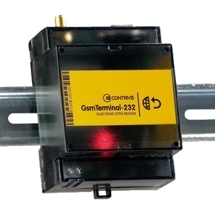 The GsmTerminal-232 allows easy GPRS connections with embedded TCP/IP stack. The connections are suitable for use in domestic and industrial environments. Its performance bandwidth and the industrial housing make it easier to quickly implement new applications in areas such as telemetry, telematics and remote control. Optional GPS receiver available for L.B.S. application. Wide range power supply voltage AC/DC sources can be integrated with opional backup battery to operate for long time even during blackouts. Features of the GSM Modem/GPRS Modem.